Michael Stafford was on top of the world. A proud member of the British Olympic Dressage Team and Olympic gold medalist, his life was perfect. Then, he lost his mount, his fiancée left him for another man, and now his brother has been arrested for manslaughter. He believes his luck has turned when he learns that a beautiful and talented stallion is available in Germany, just in time to compete in the next World Cup competition. The horse’s name is Tempest. Jessica Warren is an up and coming American dressage prodigy with a brilliant future. Orphaned at the age of 21 when her parents were tragically killed in a car accident and the legal guardian of her younger sister, Jessica has lost her competition mount to injury and needs a new horse if she wants to compete in next year’s World Cup. 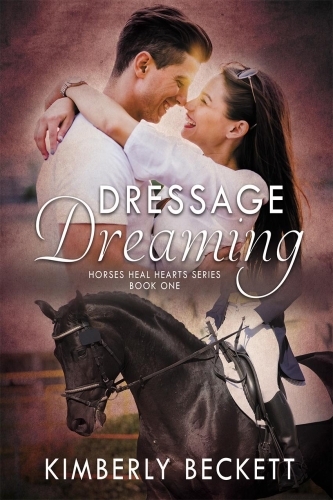 She learns of a spectacular horse available in Germany named Tempest, but when Jessica arrives in Germany with her trainer, she discovers she will have to compete with the extremely handsome and talented Michael Stafford for the right to ride Tempest. Jessica has nothing but respect for Michael, but sparks fly when they’re thrown together in a competition that both must win. Who will win Tempest? Will Michael be able to trust another woman with his heart? Will Jessica allow herself to be loved, or will her personal demons keep them apart? “Bloody hell!” Michael groaned, as his head throbbed in pain. “Stop that pounding, I’m coming, I’m coming.” Michael pulled himself up off the overstuffed leather sofa upon which he had apparently crashed sometime in the early morning hours after finishing off his last bottle of scotch. His mouth felt like it was lined with cotton, and his tongue was stuck to the roof of his mouth. His head was pounding in time with the beat of his heart, and his walk was unsteady as he took the first few steps toward the door. The clock on the wall showed it was ten o’clock. Even the slow, steady ticking away of the seconds was painful to his head this morning. He gradually made his way to the door as he tried to mentally bring himself into the present. Now, a year later, Michael was living in the refurbished manor house on the farm in Surrey that he had purchased with the money he had earned as a result of his Olympic success. He had turned the small farm into a dressage training yard and boarding stable and christened it Stafford Oaks Farm. It was what he and Emma had dreamed of that night, the best night of his life. So much had happened since then. Lionel walked around Michael’s home, opening curtains and cranking open several windows to allow a cool morning breeze to circulate through what had been a hot, stuffy home filled with dirty laundry and dishes and smelled like a cross between a men’s locker room and a garbage dump. “Look, Lionel, I think I’m entitled to an occasional drinking binge considering everything that’s happened to me in the past year.” Michael’s mind immediately flashed back over the year that had passed since he had experienced the best day of his life: winning a gold medal at the Olympic Games held in his home country. Since that day, his life had been nothing but a series of setbacks and disappointment. First, the owners of Romeo, the gifted stallion he rode to a gold medal in the Olympics, decided to take the horse out of competition immediately after the Games to make a tidy profit breeding him. Without Romeo, Michael wasn’t able to continue to compete internationally, and was having a great deal of trouble finding another horse as talented to ride in Romeo’s stead. Without the public exposure competition gleaned for him, his Olympic fame began to fade. His fiancée, Emma, who had enjoyed the glitter and attention he drew immediately following the Olympic Games, became bored with their lives after Michael moved out of the spotlight. It wasn’t long before she began acting suspicious of his relationships with other women, accusing him of being unfaithful to her. Nothing could have been further from the truth, and he had tried to explain to Emma that he had to travel to teach clinics and market his skills as a trainer, but all she seemed to be able to see were the many women who clamored to meet him and get close to him. Her suspicions baffled him, because he took great pains never to be alone with any of the women he met through his clinics and loved Emma too much to cheat on her with any other woman. Michael still wasn’t sure exactly what had happened between them, but everything seemed to fall apart right after the Olympic Games. Before the Games, he and Emma were on top of the world, looking forward to a life together living on his training yard in the country outside London, where he would raise and train horses for himself and others in dressage, and she would continue working in the city for a prestigious law firm. He was certain they loved each other unconditionally, although he must admit in hindsight that their relationship wasn’t perfect. Still, he felt betrayed, and had vowed to himself never to give his heart so foolishly ever again. Michael picked up the tabloid from his coffee table and showed it to Lionel. On the cover was a picture of Emma with a one of Britain’s most famous footballers. She was laughing and looking at him adoringly, and he seemed to enjoy her attention, smiling down and holding her close, with his arm around her waist. “I can’t go anywhere without some reminder of Emma. While standing in line at the grocery store buying food for the week, I saw this in a rack next to the checkout line.” He pointed to the photo on the cover. “It seems she has a penchant for rich and famous men,” he said bitterly. “She used to look at me like that,” Michael fumed. “Just wait until you get injured or retire, friend” he told the man in the photos, “she’ll drop you like a rock.” Unfortunately, although his head told him he had escaped a bad situation and should be grateful, his heart was still engaged, and he had tried last night to dull the pain with Scotch. Michael knew Lionel was right. His career and his life had gone seriously downhill since Emma left. While he had once been scrupulous about his preparation for public appearances and had always been punctual for clinics and lessons, he was now either late or, even worse, a last-minute cancel or no-show for fully booked weekend clinics for which he had already been paid half up front. He had also started to be chronically late for lesson clients, and one of his two working students had left him in frustration. As a result, the invitations to do clinics stopped coming, and many of his lesson clients moved on to other trainers. The agent he hired after the Olympic Games eventually dropped him. He had barely any income except for some horse boarding clients at his stable, and a couple of training clients who were also good friends and understood why he was acting out of character. Even those clients, though, were losing patience. As a result, he was becoming alarmingly close to financial ruin. He was barely able to make the monthly mortgage payments on his farm, and had been forced to live a very austere existence, the occasional drinking binge notwithstanding. As Lionel moved a pile of clothes out of the way so he could sit down on the sofa, Michael’s phone started ringing. He picked up the phone. “Yes, what is it?” Michael growled into the receiver. “Mr. Michael Stafford?” The clipped, and very formal male voice on the other line responded. “Thank you, Constable. That’s good advice. I’ll get on it right away.” Michael hung up the phone and looked at Lionel. Michael shuddered at the thought of solid food hitting his much-abused stomach, but he knew Lionel was right. He needed nourishment, and scrambled eggs would work as well as anything. “I do. If you look a bit, there should be both in there. Thanks, man.” With Lionel now occupied in the kitchen, Michael turned and went into the bathroom. After Michael left the room, Lionel could no longer suppress the malicious grin he had been hiding since he arrived at Michael’s home. His plan was working. He was, slowly and surely, ruining Michael Stafford’s life.